A classic dish, usually made with smoked haddock, but you can make it with any smoked white fish. When you next hot smoke some mackerel, try smoking pout, pollack or huss (dogfish or smoothhound) as well, just for this dish. Here is one I made with smoked smoothhound. 2 tbs chopped fresh parsley. If it is your own smoked fish, it will already be cooked. If you are using bought smoked haddock (shame) you will need to boil up the stock and pour it over the fish and leave for five minutes. Meanwhile, fry the onion gently in the melted butter and oil until slightly coloured. Stir in the curry paste, heat through for a minute, then stir in the rice. Now add exactly 500ml fish stock, either what you used to soak the fish, or made up from the cube. Bring to a simmer, then turn the heat low and cover for ten minutes. Then add the peas and fish broken into bite size pieces, cover again and cook on for another five minutes. By now the rice should have absorbed all the liquid. You can leave covered for a bit longer if it is still a bit runny. It should be neither dry nor sloppy but moist. 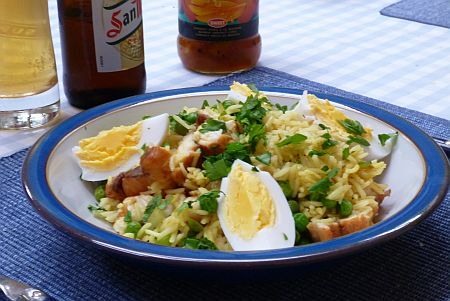 Serve in four bowls, with the quartered eggs and sprinkled with chopped parsley. Nice with mango chutney, and a nice cold beer of course.